“A topic that always comes up when stitching in a group is how to find a good place to have your embroidery scissors sharpened. I hear talk about asking your hairdresser where they get their scissors sharpened, but the recommended company is usually expensive – sometimes more than the price of new scissors.. I’ve tried taking mine to shops where they sell and sharpen knives with sometimes good results, but often with less than stellar results. 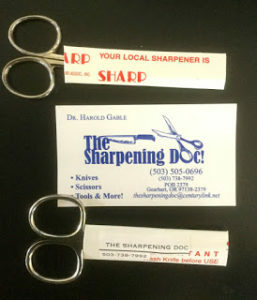 A retired doctor named Harold Gable, who lives on the Oregon Coast, is starting a scissors sharpening service, and called to ask me about advertising his new company. His wife, Cheryl, [Jane] is a stitcher and a subscriber to the magazine. Dr. Gable has been able to keep her scissors in perfect condition, so he thought it would be a nice retirement side job to help other stitchers get more life out of their expensive scissors. Out of the blue last spring I got an email from Jane B., asking if I would help her out by letting her husband practice sharpening my embroidery scissors. He had started a scissors sharpening business to keep busy in retirement and had sharpened all her scissors, so he needed more to work on. By coincidence I’d just realized that my usual pair were starting to get dull so I packed them up along with a pair of very old scissors with curved blades my mother picked up at a yard sale eons ago that I use for trimming turkeywork. I thought having regular and curved blades would give him a good workout. So off they went to Oregon for sharpening. When they came back to Chilly Hollow, I was impressed to see they were carefully packaged to protect the tips. They are perfectly sharp again, even the curved blades. There are still nicks and scratches on the scissors themselves due to long use but the blades cut as well as if they were brand new. Jane tells me that removing the scratches might dull the finish so I’ll be happy with just having them sharp. She also tells me her husband can do curved and pinking sheers as well as regular scissors. I think it’s a fabulous service, and I’m very pleased with how the scissors cut now. I highly recommend you consider using The Sharpening Doc if you don’t have a local sharpening service, which I do not. The best I could do before Jane’s offer was hope a sharpener would visit Joann’s Fabrics in November to collect and sharpen my scissors. The person they use does a nice job but it takes two weeks and they only come by once a year. New Business Card, with Happiness Highlighted! 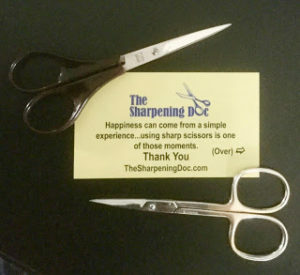 The cost to sharpen a pair of scissors at The Sharpening Doc is $5.00 but if the tips need to be restored because of a previous botched job, it’s an additional $8.00. Shipping and handling is $12.00 on top of that. And yes, you can send a batch of scissors. The priority mail box they use will hold up to fifty pounds of goods, so you can include lots of pairs for the same return shipping and handling charge as long as you stay under fifty pounds. The Sharpening Doc will figure out shipping charges for large orders if you let them know ahead of time. The shipping and handling charge covers up to $50 in insurance, so if you are sending a very expensive pair of scissors, you might want to arrange more insurance both when you ship and when the box comes back to you. 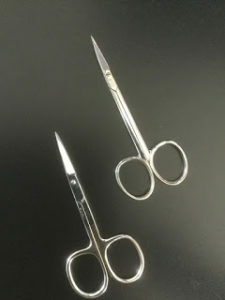 You will get an email or phone call when your scissors are shipped back with the tracking number to monitor the package. Payment should be via a personal check made out to The Sharpening Doc.